The hotel Playa Santa Ponsa is part of the same trio along with the Pionero/Santa Ponsa Park and is similarly located just 300m from the beach. 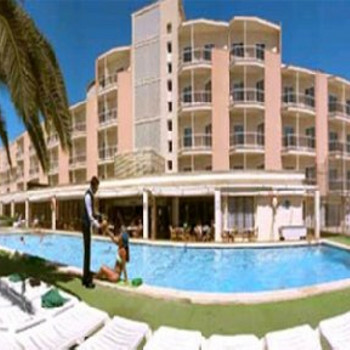 The Playa Santa Ponsa also benefited from renovation throughout in 2002.
had agreat week at this hotel. we stayed all inclusive the food was lovely always warm and plenty to choose from.found rooms very clean yes bathroom shower was small but it did the job always had clean towels everyday.staff were lovely very friendly and polite entertainment was good had some very good shows in the evening. location great beach 5mins walk from hotel. loved it would go back to this hotel had agreat time.hotel should be a 3star not 2star as stated. Hotel is pleasant for a 2 Star. Bedrooms are very small as are the shower/toilet facilties and balcony, but ok. Not all rooms have air conditoning or a fan that works, so ask for a room overlooking the pool s they are cooler in the afternoon. I thought the food was excellent, always at least two meat dishes on and a fish dish (that even Gordon Ramsay would be pleased with!) Obviously veg and salad stuffs were there, as well as a nice dessert counter .. So if not a huge choice, what was there was actually delicious! The only let down was the bar staff (not all of course) who did there best to ignore you or pretend to do other jobs rather than serve you .. and obviously this was a topic of conversation amongst the holidaymakers!! Hotel is very close to beach and shops etc so in an excellent position. Santa Ponsa is a lovely resort and yes I would go there again .. but sadly not to this Hotel.